In Paris, this was the time of Le Moulin Rouge, Les Folies Bergère and Le Can-Can. La Goulue and Jane Avril were modelling for Toulouse-Lautrec's iconic posters. Le Tour d’ Eiffel, the symbol of the city, was known the world over and Haussmann had completed his re-remodelling of Paris. Few will be lucky enough to visit all these places but the panels give much enjoyment to the arm chair traveller who can go via the Net. The awesomely talented Victor Laloux went on to build the magnificent Gare d' Orsay (now the Musée d'Orsay) in Paris. 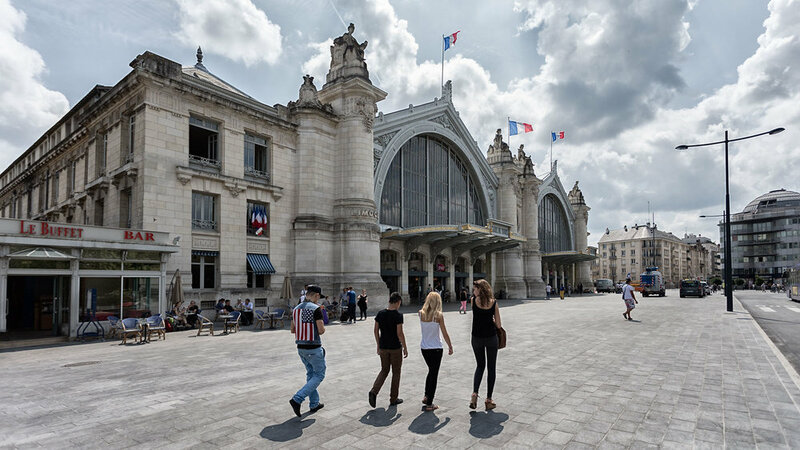 Gare de Tours is still the jumping-off point for tourists visiting the Loire Valley. Many arrive from Paris on the TGV. From here one can still travel to Bordeaux on the west coast of France, to Spain via Avignon or to Lyon, Strasbourg and Lille. There is a shuttle service to th station in St. Pierre des Corps from where passengers can travel right into Charles de Gaulle airport in Paris.